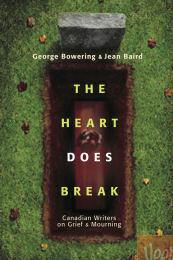 GEORGE BOWERING is a poet, novelist, essayist, critic, historian and editor. In 2002 he was appointed Canada’s first Parliamentary Poet Laureate. He is an officer of the Order of Canada and has been inducted into the Order of British Columbia. 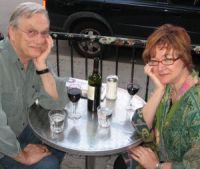 He has authored and edited many books, including several that have earned major awards. JEAN BAIRD has been an English professor, program director for an arts facility, managing editor for business publications, consultant for non-profit organizations, and creative director of Canada Book Week for the Writers’ Trust of Canada. Most recently she has been working on a BC-based project about the use of Canadian literature in secondary schools. When Jean Baird’s daughter, Bronwyn, died suddenly, Jean’s deep instinct was to turn to books to help her in her time of sudden loss. Although she found that the thoughts of counselors, psychologists, Buddhists, and self-help gurus were perhaps some help, the works that truly reached to the heart of the matter were by literary writers, largely from the UK and the US. 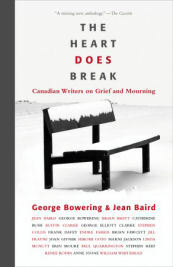 Scanning the Canadian landscape, Jean and her husband George Bowering found elegies and tributes, but little from our writers about the person who is left behind to mourn or what it takes to endure grieving. The Heart Does Break—an anthology of twenty original pieces—sets out to fill that gap. Contributors include: Austin Clarke, Jill Frayne, Marni Jackson, Paul Quarrington, George Elliot Clarke, Catherine Bush, William Whitehead, and more.